GBA Dora the Explorer: The Search for Pirate Pig's Treasure (unknown) in 22:44.03 by EZGames69. 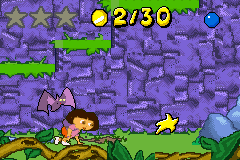 Dora the Explorer: The Search for Pirate Pig's Treasure is a platforming game based off the popular children's cartoon series Dora the Explorer that was released in 2003 for the Game Boy Advance. Dora and Boots are searching for Pirate Pig's Treasure since he lost track of it. There are 8 worlds with 3 levels in each. Throughout each level, the player must collect 3 stars in order to move on to the next level. Thanks to EZGames69, Dora and Boots are able to find Pirate Pig's Treasure in just under 23 minutes.